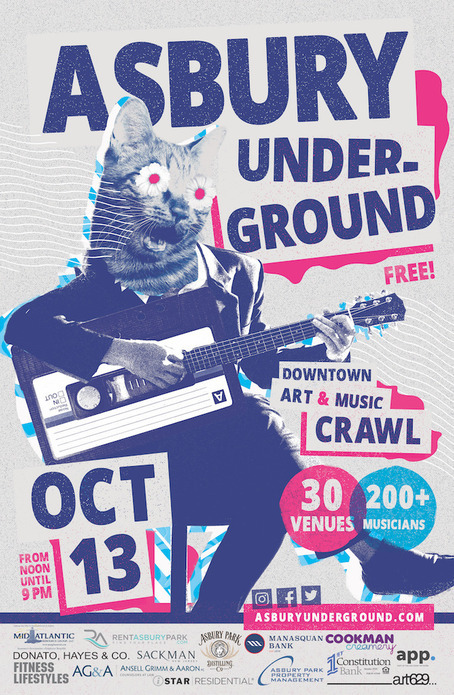 Asbury Underground is a FREE art and music crawl throughout Downtown Asbury Park, New Jersey. Come see over two hundred cumulative local musicians. Lost Romance will be doing an acoustic set on Saturday, October 13th, 2018 at Red Rose Bakery at 716 Bangs Ave., Asbury Park, NJ at 2PM. Lost Romance Guitarist Gerry Perlinski Signs Endorsement Deal With Fishman. New Brunswick, NJ – June 21st, 2018 – Gerry Perlinski, guitarist and vocalist with New Brunswick, NJ alternative rockers, Lost Romance has signed an endorsement deal with Andover, MA based industry leader in amplification, effects, and pickups for acoustic and electric instruments, MIDI control, and other product categories, Fishman. While on tour in the summer of 2017, Lost Romance’s tour stopped in Nashville for a date at the oldest bar in Tennessee, Springwater Supper Club. When in town, they arrived at the Summer NAMM show to seek out the latest and greatest in musical equipment and tech. It was there that Gerry met Vice President of Marketing & Artist Relations for Fishman, Chris DeMaria and a conversation had begun. Gerry is pleased to join the Fishman family of musicians who endorse the company’s products, which include members of Dashboard Confessional, Jason Isbell, Frank Turner, Dave Matthews, The Decemberists, John Hiatt, Jethro Tull, Darius Rucker, Kenny Wayne Shepard, Steve Earle, John McLaughlin, and many more. Lost Romance’s latest single, “Heart On A Wire” is available to stream and download on Itunes, Spotify, Bandcamp and Soundcloud here: http://www.soundcloud.com/lostromancerock. Lost Romance Guitarist Gerry Perlinski Signs Endorsement Deal With Framus Guitars. New Brunswick, NJ – February 2nd, 2017 – Gerry Perlinski, guitarist and vocalist with New Brunswick, NJ alternative rockers, Lost Romance has signed an endorsement deal with German-based guitar manufacturer, Framus. Framus was founded in 1946 and has a sister company with Warwick, both located in Markneukirchen, Germany.A long time evangelist of Framus guitars, the New Jersey native came across his endorsement deal in a somewhat unusual, but very organic way. While on a solo acoustic tour throughout the Mid South in the summer of 2016, Gerry had what most musicians would consider a disaster. Four days into the tour, Gerry had the opportunity to perform at one of the most well-known venues in Nashville, TN: The Bluebird Cafe. Arriving from Kentucky late that afternoon, he walked into the venue and began to tune his guitar. To his horror, the intonation had gone awry from the heat during the trip. Rather than throwing in the towel, he tuned it the best he could and to his surprise, it stayed in tune for the duration of the performance. The following day it was clear the guitar was out of commission. Gerry searched for a Framus dealer in the area and was pleasantly surprised to find the only Framus North American showroom; located right in the heart of Nashville! The team at the showroom was incredibly accommodating. 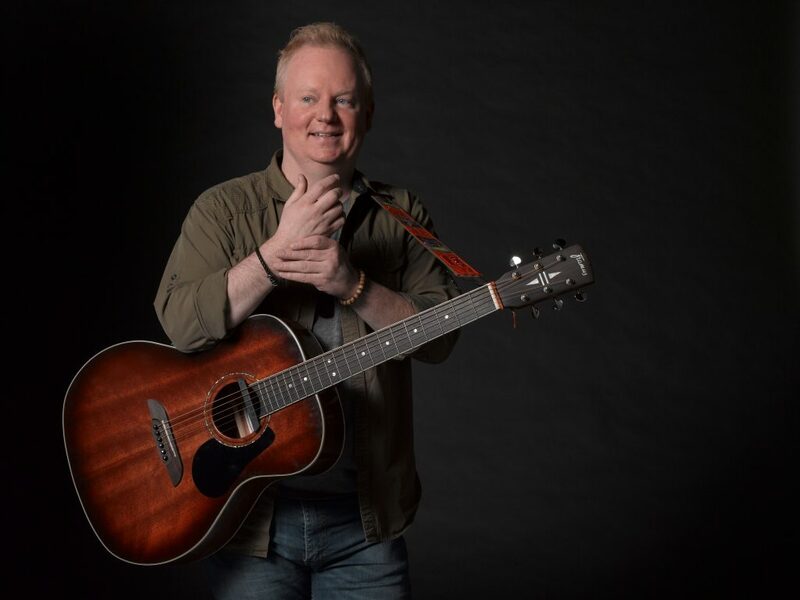 While Gerry shared his story, he played a number of Framus acoustic guitars and ultimately chose the FG 14 M – Vintage Sunburst with a Solid Mahogany top. As a result of this experience, he and the Framus team came to an agreement and the endorsement deal was struck. Gerry is pleased to join the Framus/Warwick family of musicians who are endorsed by the company, which include members of Metallica, Mick Jagger, 50 Cent, Alice In Chains, Bon Jovi, Accept and many more. 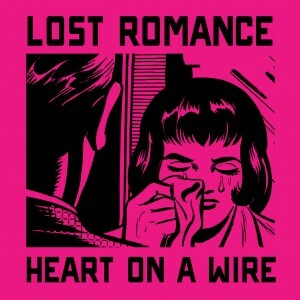 Lost Romance’s new single, “Heart On A Wire” is available to stream and download on Itunes, Spotify, Bandcamp and Soundcloud here: http://www.soundcloud.com/lostromancerock. Their new full length album, “Strum It Again” will be available in 2017. New York, NY: New Brunswick, NJ locals, Lost Romance, released their new single, “Heart On A Wire”, off their new album due late 2016. 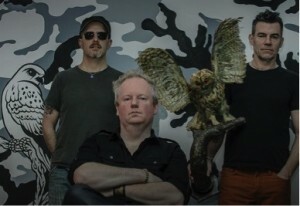 Lost Romance – rounded out by Gerry Perlinski (Guitar/Vocals), David Harman (Drums/Backing Vocals), and Dan Haag (Bass/Backing Vocals), has channeled their influences such as The Replacements, Husker Du and The Lemonheads to deliver a hard-hitting single that screams old school rock and roll. 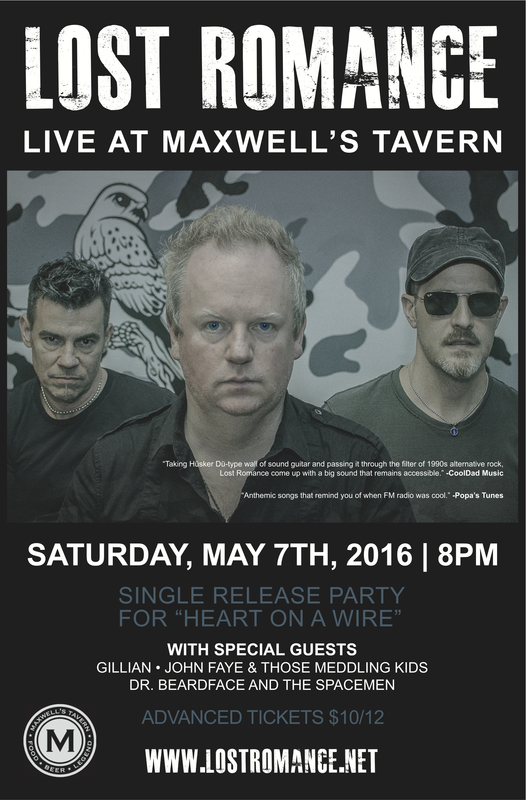 Lost Romance launched “Heart On A Wire” at Maxwell’s Tavern in Hoboken on May 7, 2016 for a special Single Release show Sponsored by Speak into My Good Eye. Since 2011, Lost Romance has made a name for themselves throughout the North East as a live act to be reckoned with. Averaging close to 100 tour dates a year, the band has been winning over fans from Maine all the way to Florida with raw, honest rock n’ roll. They have shared digital space on comps with Real Estate, The Front Bottoms, Nicole Atkins, La Sera and have shared stages with Rye Coalition, TAB the Band, Elliot Easton (The Cars), Clem Burke (Blondie) to name a few. In addition they have also been nominated for several Hoboken Music Awards including Outstanding Male Solo and E.P. of the year. *Promotional help and consideration for the single are greatly appreciated. New Brunswick, NJ based alt-rockers Lost Romance are set to release their new single, “Heart On A Wire” worldwide on May 6th, 2016. To celebrate, they are throwing a release party at Maxwell’s in Hoboken, NJ on May 7th, 2016. They will be joined by friends, indie pop rockers Gillian from Brooklyn as well as Philly’s powerpop maestro John Faye & Those Meddling Kids and their pals Dr. Beardface and The Spacemen. Doors are 8PM, Show starts at 8:30PM 21+. The show is sponsored by indie music blog, Speak Into My Good Eye. Press and/or photographers looking to cover the event, please contact Amanda at marketing@sneakypandamarketing.com. 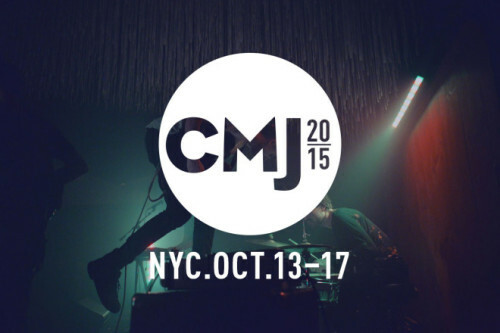 Lost Romance was featured in a documentary video by director Ishan Thakore (TBS Network) during the CMJ Music Marathon 2015. The video goes behind the scenes with the group at their CMJ performance at The Delancey in New York City as well at their rehearsal studio in Jersey City, NJ. With interviews and live performance footage, Thakore gives fans a glimpse into what it’s like to be in Lost Romance. 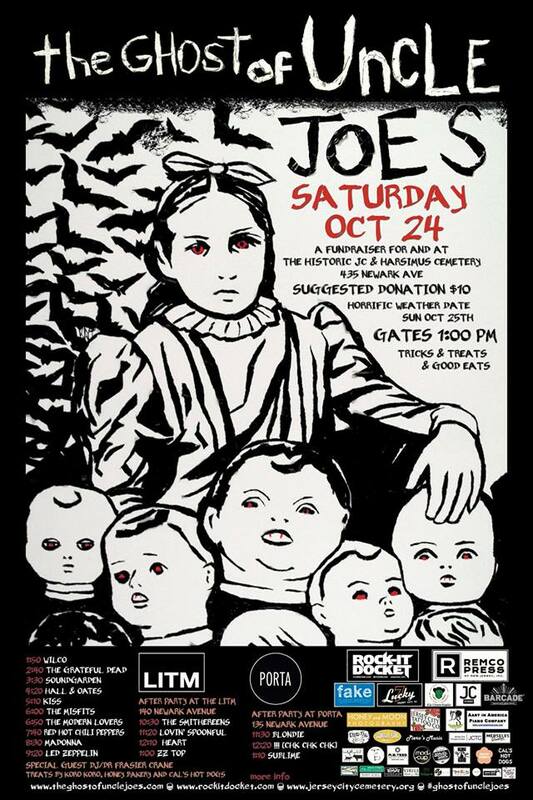 Lost Romance will be taking part in the annual Ghost Of Uncle Joe’s benefit in Jersey City, NJ. The annual fundraiser for the The Historic Jersey City and Harsimus Cemetery features local musicians dressed and performing as other artists and is organized by The Rock-it Docket. This year Lost Romance will be performing as The Smithereens for the afterparty at LITM in Jersey City on Saturday, October 24th, 2015 at 10PM. Other bands to be covered that night are Lovin’ Spoonful, Heart and ZZ Top. New Brunswick, NJ’s alt-rock powerhouse Lost Romance has been asked to perform at this year’s CMJ Music Marathon in New York City. They will be showcasing at The Delancey located at 168 Delancey St. on the Lower East Side of Manhattan on Wednesday, October 14th, 2015 at 10PM. They will be performing on the Main Floor of the venue along with Emily Danger, Shannon Allen and more. 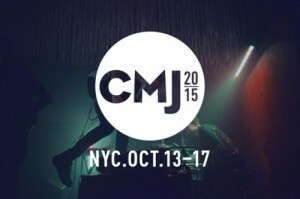 Admission is free to the public and CMJ Badge holders as well.